Martha Stewart shows how to braise everything from meat to apples and cabbage. Martha Stewart explains what a mirepoix is and the role that it plays when braising meat. 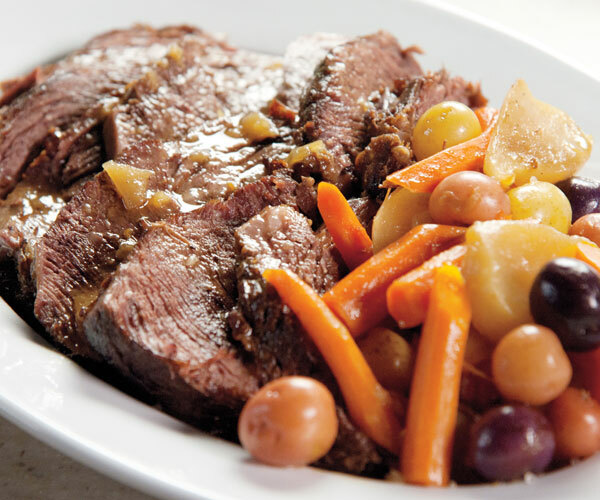 Make Martha Stewart's pot roast recipe with turnips and carrots for dinner. Martha Stewart makes this pot roast recipe in the "Briasing" episode of "Martha Stewart's Cooking School." Pat meat dry with paper towels, then season on all sides with salt and pepper. Heat a Dutch oven over high heat for 2 minutes. Then add enough oil to barely coat bottom of pot and heat until shimmering. Sear the meat until golden brown, turning to cook all sides evenly, about 8 minutes. Don't be tempted to turn the meat too soon or it will tear; instead wait until it easily releases from the pot. Once it is nicely browned all over, remove it from the pot. If there are lots of blackened bits on the bottom of the pot, wipe it clean with a paper towel, or deglaze with a little water then discard. Reduce heat to medium. Add the olive oil and all of the aromatics, and cook, stirring fairly often, until the onion is translucent, 2 to 3 minutes. You may need to increase the heat after a minute or two if the onion isn't softening, but only slightly. If the garlic or onion begins to burn, add a little water and stir up the browned bits from the bottom of the pan.